NB: Proffered for this Friday's Forgotten Books roundup. 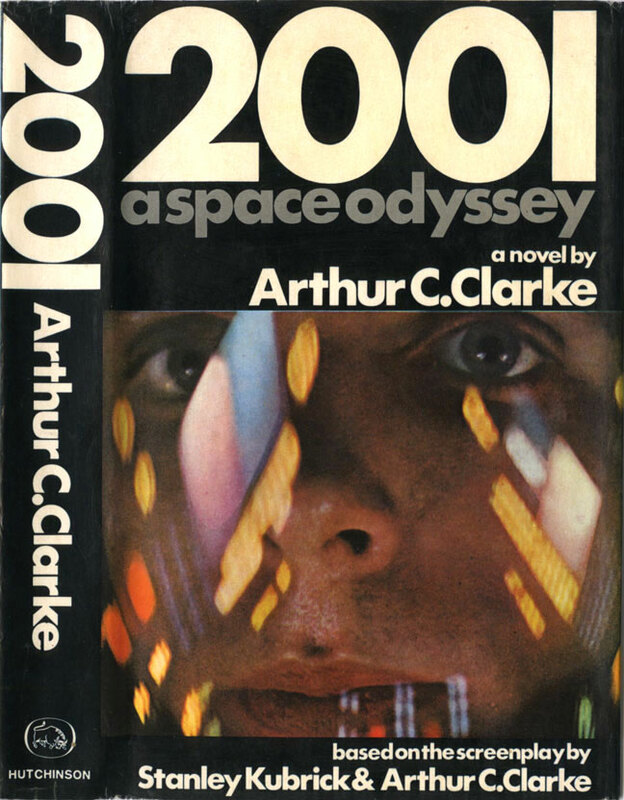 A first edition/first impression of 2001: A Space Odyssey by Arthur C. Clarke, published in hardback in 1968 by Hutchinson, dust jacket design by Michael Brett (who also designed the wrapper for the 1966 Hutchinson edition of Andrew York's The Eliminator). I spotted it in Brighton Books – on Kensington Gardens in Brighton's North Laines – offered at what I thought was a very reasonable price; ex-library copies aside, on AbeBooks at present prices for the Hutchinson first range from £65 to around £300 (unsigned), and my copy is in better condition than most. 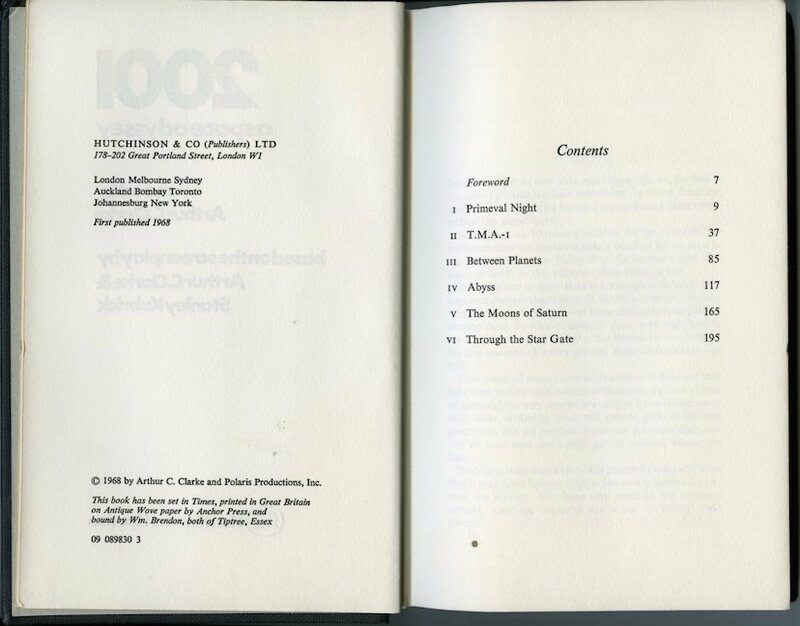 I'd seen one or two first editions of 2001 prior to coming across this one – a couple at book fairs, one in a secondhand bookshop in Essex – but they'd always been prohibitively expensive. Whereas, comparatively, this one wasn't. So I nabbed it. Why? Well, if I were to pick one film out of all the thousands I've seen over the years as my favourite, it would be Stanley Kubrick's 2001: A Space Odyssey (1968). I must have been, ooh, all of seven or eight when I first saw it, on telly in the late 1970s, possibly even in black-and-white (we didn't get a colour TV in our house until late in the day), and even though I didn't understand half of it, it blew my tiny sci-fi-obsessed mind. I've seen it countless times since – mostly on television or on video, once at the cinema when a new print with digitally remastered sound was screened at the Curzon, Mayfair in, aptly enough, 2001 (there's a wonderfully breathless account of one of those Curzon screenings here) – but my passion for the film has remained undiminished. And Clarke's novel is an inextricable part of that passion. I'm not sure when precisely I originally read the novel, but it was probably when I was in my early teens; doubtless I borrowed it from Beckenham Library, possibly even in this Hutchinson edition (or maybe the 1974 Hutchinson Educational edition, which has a different cover), which was published after the film was released rather than before it, reportedly at Stanley Kubrick's behest (as noted in John Baxter's Stanley Kubrick: A Biography [via Rob Ager's Kubrick: and Beyond the Cinema Frame]). 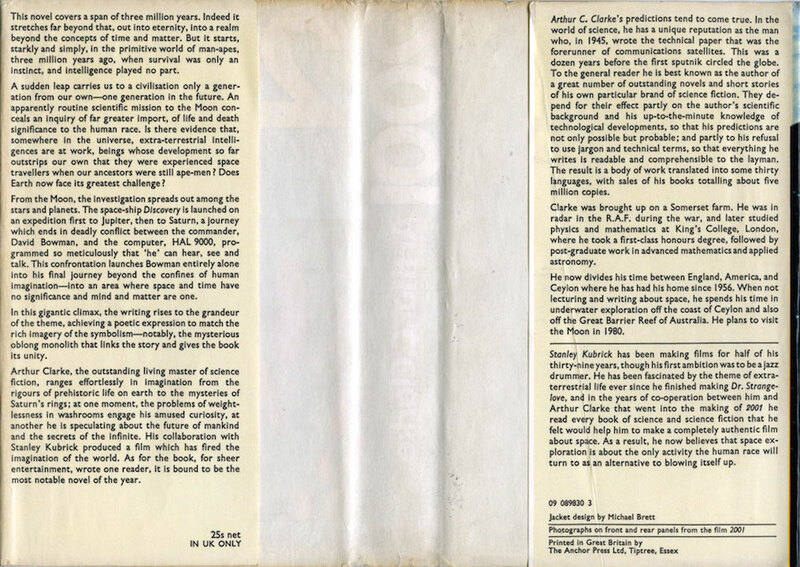 According to Kubrick, interviewed by Joseph Gelmis in 1969, the book grew out of not only the film's screenplay, which Kubrick and Clarke worked on together, but a 130-page prose treatment for the film that the two of them wrote at the outset of the project. Kubrick told Gelmis: "...Arthur took all the existing material, plus an impression of some of the rushes, and wrote the novel. As a result, there's a difference between the novel and the film." 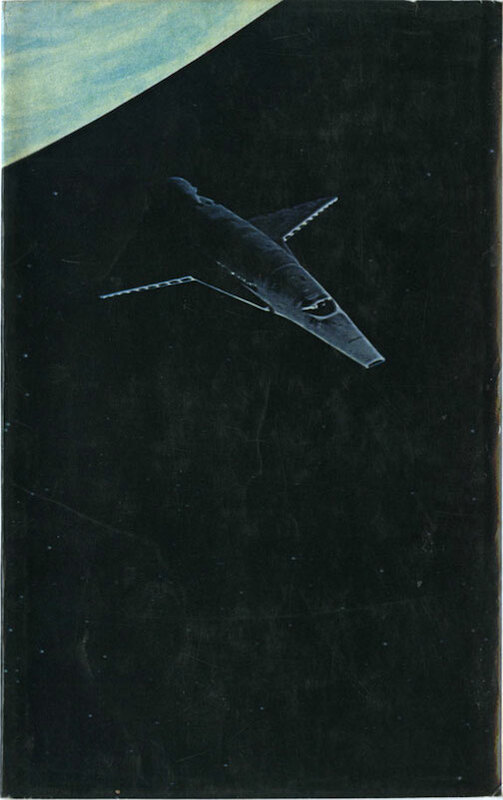 Actually there are quite a few differences, both small – the monolith which appears to the man-apes during "The Dawn of Man" section ("Primeval Night" in the book) is black in the film but "completely transparent" in the novel – and large: in the novel, Discovery's destination is Saturn, not Jupiter. But these discrepancies are much less important than what the book contributes to the experience of 2001, the way it expands upon notions and concepts which in the film are often oblique or downright cryptic. Clarke reveals more about the intentions and methods of the extraterrestrial intelligence which places the crystal monolith on the African veldt, making explicit that there are "replicas scattered across half the globe"; he posits that Saturn's rings are the byproduct of the creation of the massive monolith Dave Bowman encounters towards the end of the story – the "Star Gate" which Bowman travels through; and he embellishes Bowman's interstellar journey through the Star Gate, using everyday language to detail incredible sights: "a Grand Central Station of the Galaxy"; "a gigantic orbital parking lot". None of this ruins the film's mystique; rather it enhances it, opening up a greater understanding of Kubrick's masterpiece whilst still leaving much inexplicable, unfathomable. Even with the differences between them, book and film are as one, the one feeding into the other, and vice versa. I'd go so far as to say that a full appreciation of Kubrick's film isn't really possible without Clarke's novel – a conclusion this contemporaneous New York Times review of the book also reaches – but if there were any lingering doubt as to its essential, inseparable nature, it's also the source of the frequently misattributed Dave Bowman utterance "my God – it's full of stars! ", which doesn't actually appear in the film (it makes its film debut in the 1982 sequel, 2010: Odyssey Two). Been many a year since I read this--I think it's a less interesting book than Childhood's End, that to some extent restates the ideas of that book in a much more benign form--the aliens are expanding our consciousness, not using us as silicon chips in some kind of inter-stellar computer, destroying all life on earth in the process (I found that a rather repulsive concept). Still, I remember finishing the book pretty quickly. It had nowhere near the impact of the film--I don't think any film ever hit me so hard. My dad took me to see it at a local theater, and for about an hour after I saw it, my teeth were chattering. It wasn't from the cold. Kubrick could really get under your skin sometimes, particularly when he had such interesting ideas to work with. Interestingly, just the year before 2001 came out, the Hammer film version of Quatermass and the Pit was released, to much less acclaim and controversy--the visuals can hardly compare (the acting was quite a bit better, but of course there's hardly any acting at all in 2001--the most impressive performance is from HAL). I'll always think Clarke got at least a few ideas to flesh out his original concept from the original short story from Nigel Kneale's BBC teleplay of "Quatermass and the Pit" that was boiled down to make the Hammer film adaptation. But entirely possible Kneale (who in public always talked contemptuously of science fiction) got a few ideas from "Childhood's End"--unlike Clarke, he was not the least bit sympathetic to the concept of advanced aliens using us as catspaws. I've got a paperback of Childhood's End waiting to be read, although who knows when I'll get round to it. In fact I'm not sure if I've read any Clarke other than 2001/2010/2061, and even that last one I have my doubts as to whether I have or haven't. Pretty sure I haven't read 3001. But anyway: I wouldn't say 2001 (the novel) is the greatest book ever written, but to my mind it does enhance the film.